刘健, 史杰, 姚鑫, 李钦, 常志勇. 2018. 帕米尔高原东北缘活动构造对塔什库尔干盆地地热控制作用[J]. 中国地质, 45(4): 681-692. LIU Jian, SHI Jie, YAO Xin, Li Qin, CHANG Zhiyong. 2018. The control of neo-tectonic activity over geothermal resource in the Taxkorgan Basin on the northeastern margin of the Pamir[J]. Geology in China, 45(4): 681-692. (in Chinese with English abstract). About the first author: LIU Jian, male, born in 1970, senior engineer, majors in structural geology；E-mail:jianliu686@163.com. Abstract: The northeastern Pamir on the northwest margin of the Tibetan Plateau is one of the regions with strong neotectonic movement. Located in the northeastern Pamir, the Taxkorgan basin is controlled by regional Kongur tensile faulting. The strong neotectonism, high terrestrial heat and abundant underground water of the basin constitute the regional tectonic and hydrogeological conditions for geothermal resources. 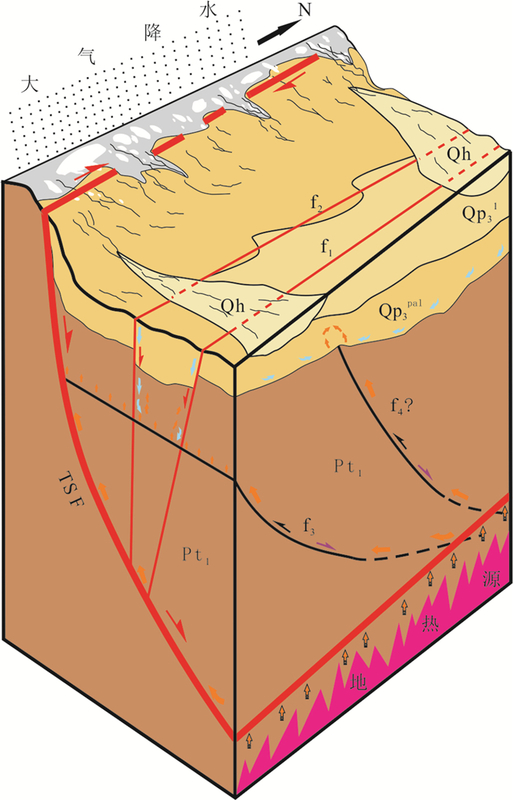 Tectonic investigation in Quman area of northern Taxkorgan basin indicates the NNE-striking normal faults of f1 and f2 were active in late Quaternary whereas the subtle EW-striking fault of f3, whose nature was different in different structural stages, was developed only below the Quaternary sediments. These faults are the secondary fractures of Tashkorgan fault formed in different tectonic episodes. 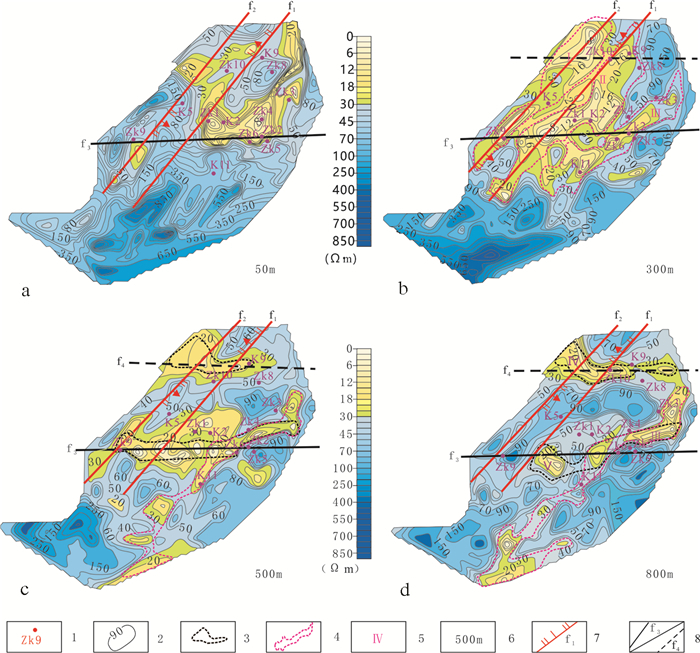 Based on the data of geological structure, age model of the section of the lacustrine deposits, EH-4 electromagnetic image and drilling, the authors hold that the NNE-striking normal faults were conduit-pipe and EW-striking thrust fault was heat conduction pathway. The atmospheric precipitation from the surrounding areas of the basin was heated by convection heating along the intersection of the different striking faults. The geothermal model involves heat source from terrestrial heat flow, gradually heating of deep circulated underground water and tectonic control of water and heat. Bard E, Arnold M, Hamelin B. 1998. Radiocarbon calibration by means of mass spectrometric 230Th/234U and 14C ages of corals:An updated database including samples from Barbados, Mururoa and Tahiti=La calibration au radiocarbone au moyen de la spectrométrie de masse 230Th/234U[J]. Radiocarbon. Burtman V S, Molnar P. 1993. Geological and geophysical evidence for deep subduction of continental crust beneath the Pamir[J]. Special Paper of the Geological Society of America, 281(2): 248-251. Chevalier M L, Li Haibing, Pan Jiawei, Pei Junling, Wu Fuyao, Xu Wei, Sun Zhiming, Liu Dongliang. 2011. 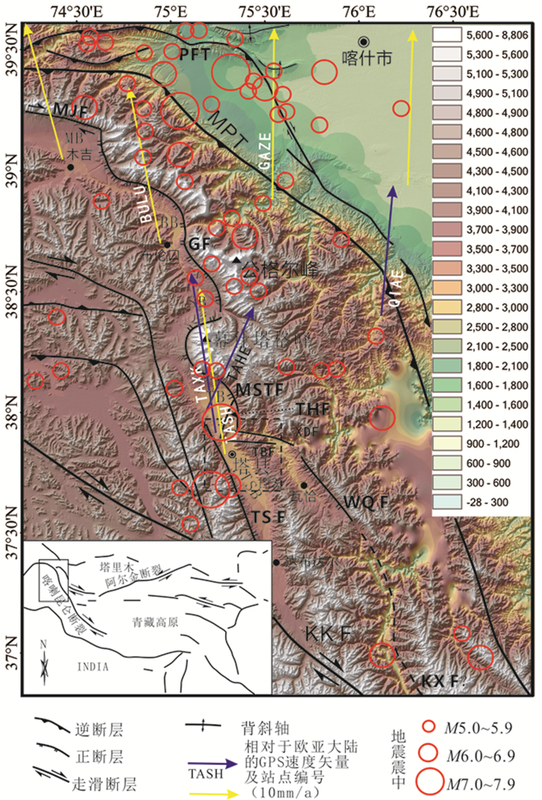 Fast slip-rate along the northern end of the Karakorum fault system, western Tibet[J]. Geophys. Res. Lett., 38: 38 L22309. Chen Jie, Li Tao, Sun Jianbao, Fang Lihua, Yao Yuan, Li Yuehua, Wang Haoran, Fu Bo. 2016. Coseismic surface ruptures and seismogenic muji fault of the 25 November 2016 Arketao Mw6.6 earthquake in northern Pamir[J]. Seismology and Geology, 38(4): 1160-1174 (in Chinese with English abstract). Chen Jie, Li Tao, Li Wenqiao, Yuan Zhaode. 2011. Late Cenozoic and present tectonic Deformation in the Pamir Salient, northwestern China[J]. Seismology and Geology, 33(2): 241-259 (in Chinese with English abstract). Dong Chen, Zhang Jizhen. 2008. Application and effect of EH4 magnetotelluric technology[J]. Railway Construction Technology(Supp. ): 529-543 (in Chinese). Hu Shengbiao, He Lijuan, Wang Jiyang. 2000. Heat flow in the continental area of China:A new data set[J]. Earth & Planetary Science Letters, 179(2): 407-419. Jin Wanglin, Li Shixiang. 2012. The effect of EH4 method in bauxite deposit prospecting[J]. Mineral Exploration, 41(7): 112-116. Ke Shan, Luo Zhaohua, Mo Xuanxue, Zhang Wenhui, Liang Tao, Zhan Huaming. 2008. The geochronology of Taxkorgan alkali complex, Pamir syntax[J]. Acta Petrologica Sinica, 24(2): 315-324 (in Chinese with English abstract). Kumar P, Yuan X, Kind R, Kosarev G. 2005. The lithosphere-asthenosphere boundary in the Tien Shan-Karakoram region from S receiver functions:Evidence for continental subduction[J]. Geophysical Research Letters, 32(32): L07305. Li Fu, Li Hua, Yang Jian. 2012. EH4 conductivity imaging system used in geological surveys in the southwest area[J]. Metal Mine, 41(7): 112-116. Li Haibing, Van der Woerd J, Sun Zhiming, Meriaux A-S, Tapponnier P, Ryerson F J, Si Jialiang, Pan Jiawei. 2008. Late Quaternary left-slip rate and large earthquake recurrence time along the Kangxiwa(or Karakax)segment of the Altyn tagh fault, northern Tibet[J]. Quaternary Research, 28(2): 197-213 (in Chinese with English abstract). Li Haibing, Valli F, Liu Dunyi, Xu Zhiqin, Yang Jingsui, Arnaud N, Tapponnier P, Lacassin R, Chen Songyong, Qi Xuexiang. 2007. The formation age of Karakoram fault:The age restriction of the zircon SHRIMP U-Pb[J]. Chinese Science Bulletin, 52(4): 438-447 (in Chinese). Li Wenqiao, Chen Jie, Yuan Zhaode, Huang Mingda, Li Tao, Yu Song, Yang Xiaodong. 2011. Coseismic surface ruptures of multi segments and Seismogenic fault of the Tashkorgan earthquake in Pamir, 1895[J]. Seismology and Geology, 33(2): 260-276 (in Chinese with English abstract). Liang Yongdon, Liu Yanhua, Fan Shaoyun, Wang Zhichen, Cheng Jianwen. 2010. Application of EH-4 electromagnetic sounding to the survey of fault structure in uranium district[J]. Uranium Geology, 26(3): 166-171. Liu Dongliang, Li Haibing, Pan Jiawei, Chevalier Marie-Luce, Pei Junling, Sun Zhiming, Si Jialiang, Xu Wei. 2011. Morphotectonic study from the northeastern margin of the Pamir to the West Kunlun range and its tectonic implications[J]. Acta Petrologica Sinica, (11): 3499-3512 (in Chinese with English abstract). Luo Zhaohua, Mo Xuanxue, Ke Shan. 2003. Ages of Taxkorgan alkaline intrusive complex and their geological implications[J]. Geology of Xinjiang, 21(1): 46-50 (in Chinese with English abstract). Pang Zhonghe, Yang Fengtian, Yuan Lijuan, Li Yiman. 2011. Geothermal display and predication of the thermal storage temperature in Taxian basin, Xinjiang[J]. Geological Review, 57(1): 86-88 (in Chinese with English abstract). Robinson A C, Yin An, Manning C E, Mark Harrison T, Zhang Shuanhong, Wang Xiaofeng. 2007. 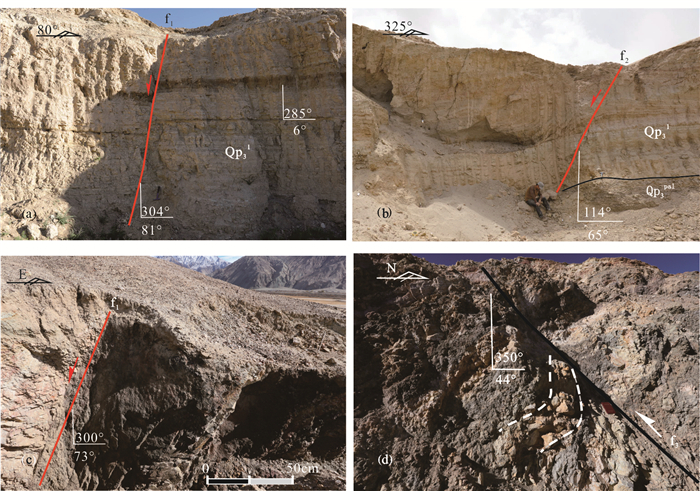 Cenozoic evolution of the eastern Pamir:Implications for strain-accommodation mechanisms at the western end of the Himalayan-Tibetan orogeny[J]. Geological Society of America Bulletin, 119(7): 882-896. Shi Yafeng, Ge Yu, Liu Xiaodong, Li Bingyuan, Yao Tandong. 2001. Reconstruction of the 30-40 ka bp, enhanced Indian monsoon climate based on geological records from the Tibetan Plateau[J]. Palaeogeography Palaeoclimatology Palaeoecology, 169(1/2): 69-83. Sobel E R, Chen Jie, Schoenbohm L M, Thiede R, Stockli D F, Sudo M, Strecker M R. 2013. Oceanic-style subduction controls late Cenozoic deformation of the Northern Pamir orogeny[J]. Earth & Planetary Science Letters, 363: 204-21. Stuiver M, Reimer P J, Reimer R. CALIB 5. 0. 2[WWW program and documentation[J]. 2005. Henan Geological Survey. 2004. 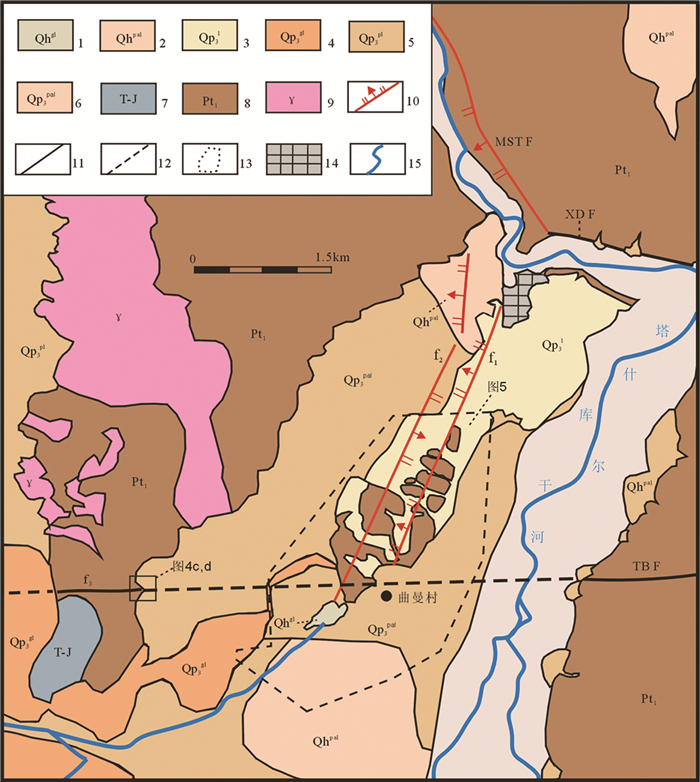 Tashikuergan1: 250, 000 Regional Geological Mapping and Report, 1-327. Wang Jiyang. 1996. Low-medium temperature geothermal system of convective type[J]. Earth Science Frontiers, (3): 96-100 (in Chinese with English abstract). White D E. 1986. Subsurface waters of different origins. Extended Abstracts of Fifth International Symposium on Water-Rock Inter action[J]. National Energy Authority of Iceland, Reykjavik: 629-632. Zhang Senqi, Li Changhui, Sun Wangyong, Xu Weilin, Xin Yuanhong, Shi Weidong, Wang Zhanchang, Fan Yonggui. 2008. Construction of the conceptual model of thermal reservoir structure of the Xining basin, China[J]. Geological Bulletin of China, 27(1): 126-136 (in Chinese with English abstract). 陈杰, 李涛, 孙建宝, 房立华, 姚远, 李跃华, 王浩然, 付博. 2016. 2016年11月25日新疆阿克陶MW 6.6地震发震构造与地表破裂[J]. 地震地质, 38(4): 1160-1174. 陈杰, 李涛, 李文巧, 袁兆德. 2011. 帕米尔构造结及邻区的晚新生代构造与现今变形[J]. 地震地质, 33(2): 241-259. 董晨, 张吉振. 2008. EH4大地电磁技术的适用及应用效果[J]. 铁道建筠技术, (增刊): 529-543. 李富, 李华, 杨剑. 2012. EH4电导率成像系统在西南地区地质调查中的应用[J]. 金属矿山, 41(7): 112-116. 李海兵, Valli F, 刘敦一, 许志琴, 杨经绥, Arnaud N, Tapponnier P, Lacassin R, 陈松永, 戚学祥. 2007. 喀喇昆仑断裂的形成时代:锆石SHRIMP U-Pb年龄的制约[J]. 科学通报, 52(4): 1089-1100. 李海兵, Van der Woerd J, 孙知明, Meriaux P A S, Tapponnier F J, Ryerson, 司家亮, 潘家伟. 2008. 阿尔金断裂带康西瓦段晚第四纪以来的左旋滑移速率及其大地震复发周期的探讨[J]. 第四纪研究, 28(2): 197-213. 李文巧, 陈杰, 袁兆德, 黄明达, 李涛, 余松, 杨晓东. 2011. 帕米尔高原1895年塔什库尔干地震地表多段同震破裂与发震构造[J]. 地震地质, 33(2): 260-276. 梁永东, 刘艳华, 范少云, 王志成, 成剑文. 2010. EH一4电磁测深法在铀矿区断裂构造勘查中的应用[J]. 铀矿地质, 26(3): 166-171. 刘栋梁, 李海兵, 潘家伟, CHEVALIER Marie-Luce, 裴军令, 孙知明, 司家亮, 许伟. 2011. 帕米尔东北缘-西昆仑的构造地貌及其构造意义[J]. 岩石学报, (11): 3499-3512. 罗照华, 莫宣学, 柯珊. 2003. 塔什库尔干碱性杂岩体形成时代及其地质意义[J]. 新疆地质, 21(1): 46-50. 金旺林, 李士祥. 2012. 用EH4寻找铝土矿的效果研究[J]. 矿产勘查, 03(1): 82-85. 柯珊, 罗照华, 莫宣学, 张文会, 梁涛, 詹华明. 2008. 帕米尔构造结塔什库尔干碱性杂岩同位素年代学研究[J]. 岩石学报, 24(2): 315-324. 庞忠和, 杨峰田, 袁利娟, 李义曼. 2011. 新疆塔县盆地地热显示与热储温度预测[J]. 地质论评, 57(1): 86-88. 塔什库尔干地区1: 25万区域地质图及报告, 2004. 河南地质调查局, 1-327. 汪集旸. 1996. 中低温对流型地热系统[J]. 地学前缘, (3): 96-100. 张森琦, 李长辉, 孙王勇, 许伟林, 辛元红, 石维栋, 王占昌, 范永贵. 2008. 西宁盆地热储构造概念模型的建立[J]. 地质通报, 27(1): 126-136.